References _fillHistoryTree(), _populateWindowData(), XAP_App::getStringSet(), XAP_StringSet::getValueUTF8(), XAP_Dialog::m_pApp, m_windowMain, m_wListWindow, m_wTreeView, newDialogBuilder(), s, s_history_selected(), and UT_ASSERT. References gchar, XAP_Dialog_History::getListHeader(), XAP_Dialog_History::getListItemCount(), XAP_Dialog_History::getListItemId(), XAP_Dialog_History::getListValue(), and m_wTreeView. 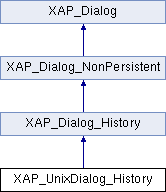 References XAP_Dialog_History::getHeaderLabel(), XAP_Dialog_History::getHeaderValue(), XAP_Dialog_History::getListTitle(), XAP_App::getStringSet(), localizeButton(), localizeLabelMarkup(), XAP_Dialog::m_pApp, and setLabelMarkup(). References _constructWindow(), abiDestroyWidget(), abiRunModalDialog(), XAP_Dialog_History::m_answer, UT_ASSERT, and UT_return_if_fail. Referenced by _constructWindow(), and _fillHistoryTree().